Trade it. Love it. Wear it. 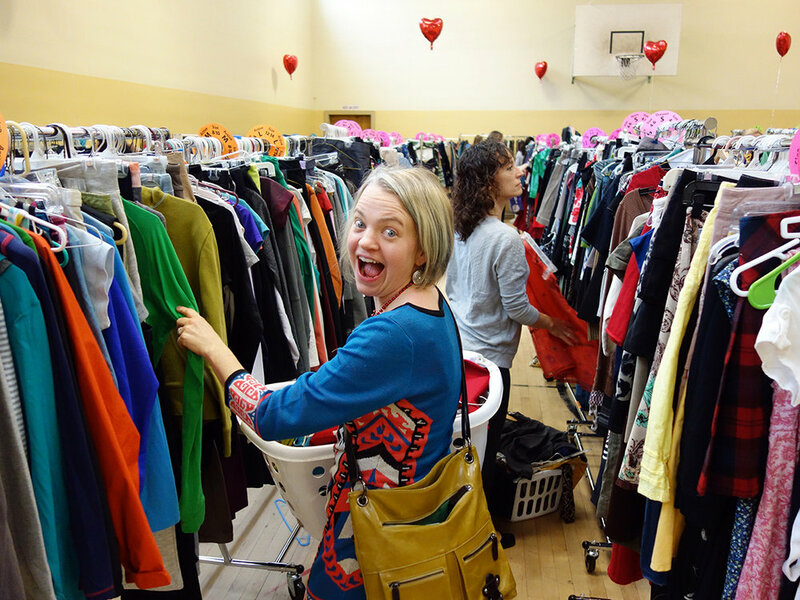 Register for Swapapalooza 2018 and start weeding those closets! We take clothing, footwear, handbags and jewelry in good condition. If it's still got style left in it, bring it to our drop-off event on March 23. Liberate yourself from all that stuff you're not wearing! Our Friday night drop-off event is fun and fast. Bring your clothing on hangers and check them in for processing through our "Friendly Fashion Filters!" You earn one Trade Point for every two items we accept. Anything that doesn't make the cut can be donated or taken home. Our filtering elves work hard through the night to sort items by type and size. Arrive on Saturday morning to a beautifully organized "store" where you can "shop" to your heart's content. Grab our free stylist to get advice on new-to-you items and make them yours! We all have things in our closets we don't wear. Cute shoes that never fit. The blouse that's gorgeous, but requires a strapless bra. (You know THAT ain't happenin'). Jeans you swear you'll fit into again—maybe. Sure, they're all great pieces, but they're gathering dust. So liberate yourself by prepping them for Drop Off, trading them in, and finding 'new-to-you' items you'll actually wear! The drop-off part of our event opens at 4 PM. Bring all clothing items on hangers and enjoy a little 'me time' while you're items pass through our Friendly Fashion Filters. Average time for the whole process is about 20 minutes. Drop-off closes at 8 PM sharp. Please arrive at least 15 minutes before we close the doors. Why? We stay to sort and organize all those fabulous items into the night. So the later you are, the less sleep we get, and that ain't pretty. You'll check in, we'll give you your Trade Points, and line you up in the order you registered. At 9:30 sharp we'll announce the "Business Class" (early entry) winners. Business Class winners enter at 9:35 AM. General entry begins at 9:40 AM.